The Bishop of Leeds the Rt Rev’d Nick Baines delivered a measured and thoughtful speech in the House of Lords on the EU (Withdrawal) Bill. His theme was basically the need to transcend divisions and be a lot nicer to one another. Lord Adonis obviously wasn’t listening. The Bishop then made a nifty £75 by turning the substance of his speech into a BBC Radio 4 ‘Thought for the Day’, entitled ‘What’s it all for?‘. John Humphrys doubtless found it deeply, deeply boring. One might be forgiven for dwelling on a few niggles with the Bishop’s speech/TFTD, not least of which is his apparent bewildered exasperation. “What’s it all for?” he sighs, seemingly oblivious to the fact that this question has been answered time and again by intelligent and thoughtful Leavers, yet so many equally intelligent and equally thoughtful Remainers refuse to hear, and when they do hear they don’t seem to listen or understand. This isn’t about repatriating immigrant Portuguese nurses or calculating whether bananas imported from Colombia will cost less; it’s about democracy, accountability, and sovereignty. It’s about taking back control of our law-making, our environment, our justice, our agriculture, our fisheries, our borders, and our ability to enter into bilateral trade agreements with whomever we want. Brexit is a truly global vision, which the Prime Minister has explained. Those who persist in reducing Brexit to matters of economics or Treasury/CBI trumpet blasts simply don’t understand the beating heart of Euroscepticism: freedom is more important than Mammon; homo sapiens is happier than homo economicus. Surely Nick Baines can understand this? 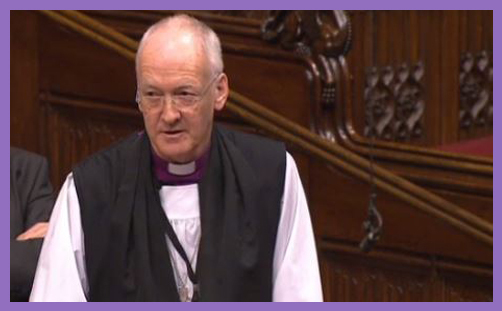 His entire House of Lords speech is an exhortation to all that is noble, good, holistic and catholic. This isn’t contingent on the UK’s membership of an anti-democratic, bureaucratic, aloof and corrupt superstate. Even the Archbishop of Canterbury is beginning to understand the possibilities: Brexit, he observes, offers “a wide and liberal future (of) great hope and opportunity”. He’s not quite yet spying a land flowing milk and honey, but he certainly beats the Bishop of Leeds’ proclivity for gloom and doom. How you have felt, O men of Athens, at hearing the speeches of my accusers, I cannot tell; but I know that their persuasive words almost made me forget who I was – such was the effect of them; and yet they have hardly spoken a word of truth. But many as their falsehoods were, there was one of them which quite amazed me; – I mean when they told you to be upon your guard, and not to let yourselves be deceived by the force of my eloquence. They ought to have been ashamed of saying this, because they were sure to be detected as soon as I opened my lips and displayed my deficiency; they certainly did appear to be most shameless in saying this, unless by the force of eloquence they mean the force of truth; for then I do indeed admit that I am eloquent. But in how different a way from theirs! Well, as I was saying, they have hardly uttered a word, or not more than a word, of truth; but you shall hear from me the whole truth: not, however, delivered after their manner, in a set oration duly ornamented with words and phrases…(Plato: Apology). Sophistry is intrinsic to democratic politics: the necessity of artful persuasion is a necessary evil, and the unadulterated truth rarely satisfies itching ears or selfish hearts and minds. Plato’s ‘Noble Lie’ (The Republic, III, 414) is a myth propagated by the governing elite for the pursuit of social harmony, or to ensure “human flourishing and the Common Good”, as the Bishop of Leeds might put it. It is a propagandist lie exercised by totalitarian rulers. Bishop Nick will doubtless be familiar with the analogous ‘pious fiction’ – a scriptural narrative woven by holy men or women which has no literal truth but inculcates love and fosters peace. Spiritually, it is judged to do no harm, so the end justifies the means. Secondly, the referendum tore off the veneer of civilised discourse in this country and unleashed – gave permission for, perhaps – an undisguised language of suspicion, denigration, hatred and vilification. To be a Leaver is to be narrow-mindedly stupid; to be a Remainer is to be a traitor. Our media – and not just the ill-disciplined bear pit of social media – have not helped in challenging this appalling rhetoric or the easy acceptance of such destructive language. Note, again, that it was the referendum which unleashed the incivility; it was the democratic act which “gave permission for” expressions of hatred, as though these had never existed before. And then we get a curious contrast: Leavers, the Bishop observes, are routinely tarnished with allegation of stupidity; Remainers with treachery. With respect, these vilifications are by no means comparable: Leavers are more routinely smeared with xenophobia, racism and bigotry (ie beyond the bounds of social acceptance), which rather transcends slightly irritating allegations of mental impairment and constitutes something more analogous to ‘traitor’. These niggles aside, the Bishop’s speech was a welcome contribution to the debate because the Government is being woefully inadequate in its negotiations and utterly dire in its communications. But you can’t hang the rise of “suspicion, denigration, hatred and vilification” on Brexit unless you’re prepared to weave a narrative of utopian delusion for all public discourse prior to 23rd June 2016. Wasn’t the Reformation a little more convulsive, a tad more divisive, and whole lot more fiery?